I have many friends who were either born in Italy, or have visited there. I usually get the same three answers. These cities are Rome, Venice and Florence. I could understand Venice being a favourite city because of it’s uniqueness. A city with canals instead of streets brings out the romance in all of us. 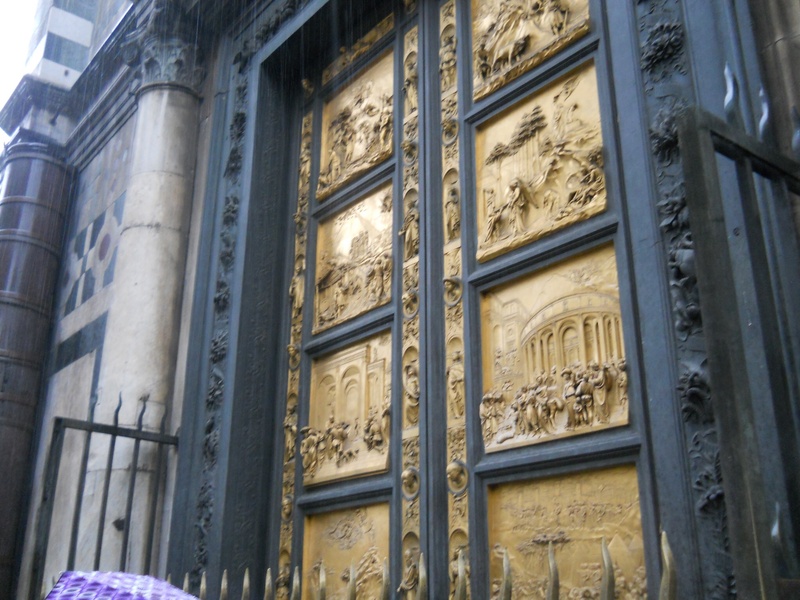 Rome, of course was my choice of cities because you can still experience ancient history alive and up close. The thoughts of entering any building over a thousand years old sends my senses reeling. The thought of walking where Julius Caesar walked is astounding. However, I could not understand why Florence would be chosen as a favourite city. That all changed of course, the day that I walked the streets of Florence for the first time. 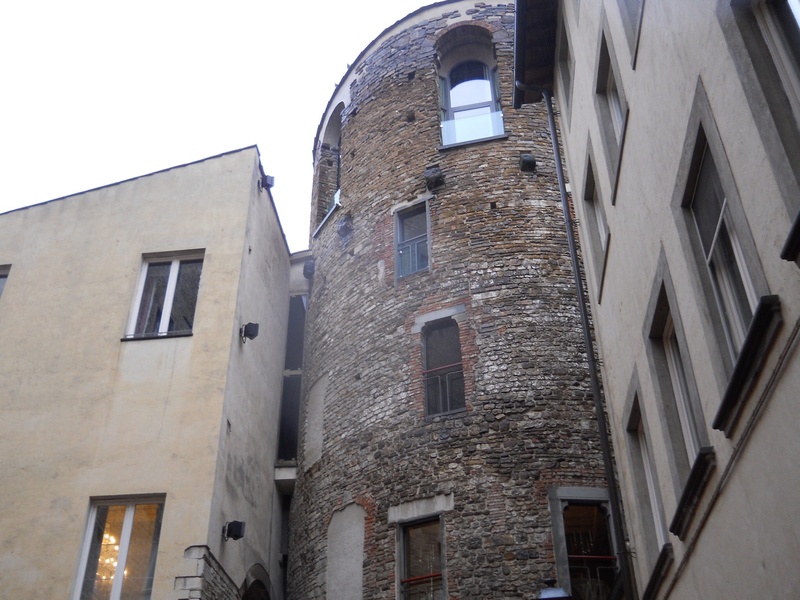 …Florence is all things Renaissance. It heralded the end of the dark ages and ushered in the beginnings of musical creativity. It was the birth of modern thinking and the concept of artisans, intellect and the importance of literacy and education. The magical ambiance of those heady days of Michelangelo and Leonardo da Vinci can still be felt. It oozes from each of the stony structures. It blows like the wind in the terraces and piazzas. It transforms the eye with every work of art. Yes, I now understand why someone would choose Florence as their favourite city. And the rest is experience. This leads to inevitable exhaustion that you’ll feel at the end of the day. I knew we were getting close to Florence when I could see the russet red rooftops that are a trademark of the city. Surprise, surprise… the rain had followed us all the way from Rome. I tried not to think about it as I continued to scan the horizon for the landmark that Florence is best known for. I got my first glimpse of the Duomo as it slowly revealed itself in the hazy distance. The Duomo for those of you who aren’t up on all things Italian, is a very large cathedral best known for its enormousness red oval shaped dome. It took centuries to build because the architects and engineers of the time just could not figure out how to build a dome with the same grandeur of the Pantheon in Rome. Frank and I had sought out all the documentaries we could possibly find on the history of this truly beautiful Italian accomplishment. Now, as beautiful as the Duomo was from the outside, both Frank and I knew that the beauty underneath of the dome would be truly life altering. The question was, would we be able to get there without first drowning from all the rain? Crossing the Arno River in itself was an epoch in my life. How many times had I used this word to help fill in a crossword puzzles? It was nice to know, that the next time I would print out this four letter word in response to 16 across, I would be able to tell myself, that yes, I was there! 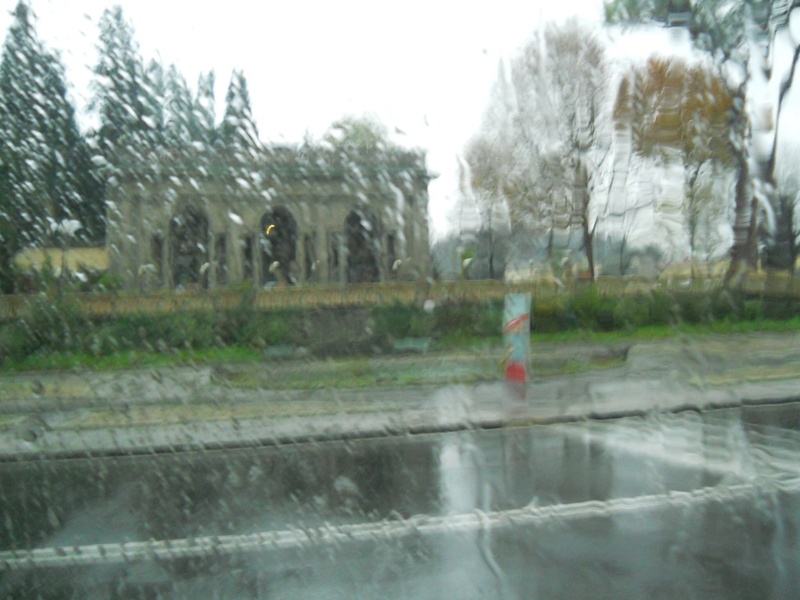 The bus stopped at a ravine overlooking the city of Florence. 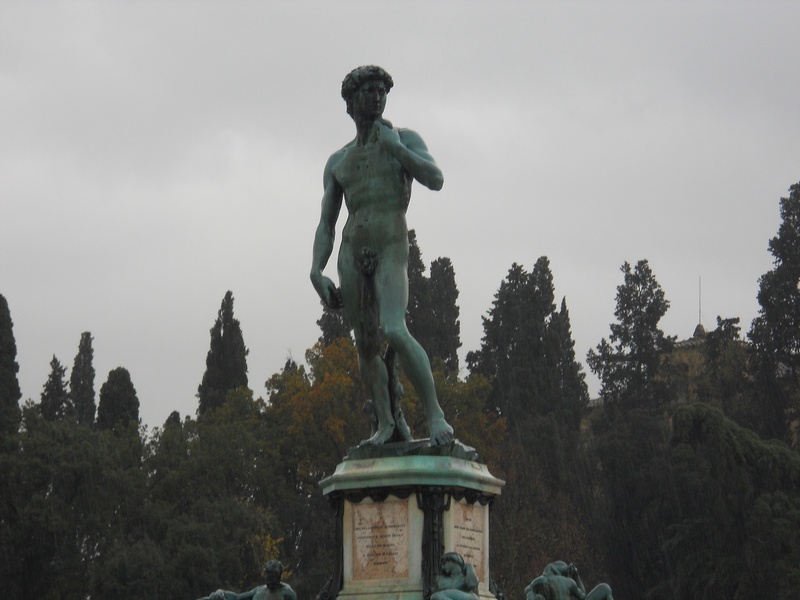 Standing in the middle of the terrace was a very tired and wet looking statue of David. Not the real one mind you, but the first of many replica David statues that we would see that day. We could see easily see the Duomo in the distance against a backdrop of heavy grey rain clouds. Yes, we would not make it through this day without getting drenched. That much was a given. 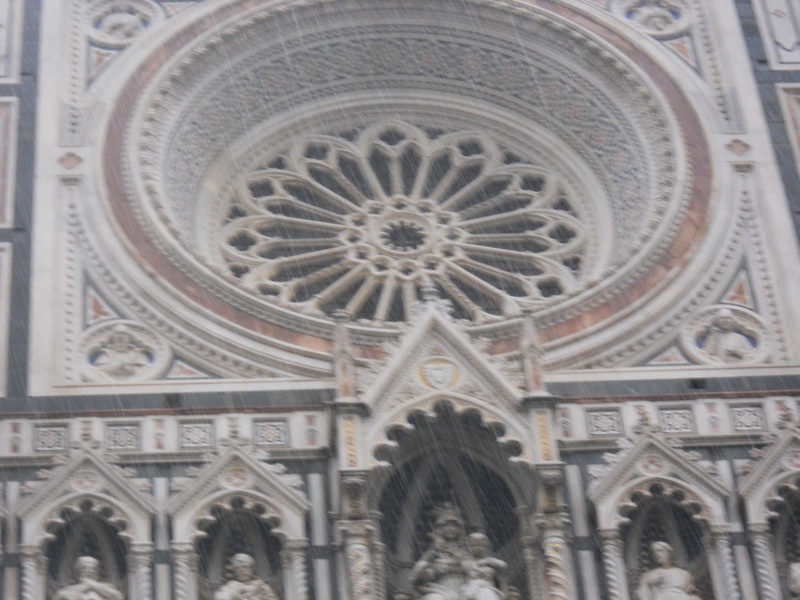 Even seeing the Duomo surrounded by the rainclouds was a beautiful sight. All the photos I had seen of it were taken on beautiful and sunny days. I had never seen it quite like this, and for that I was grateful. 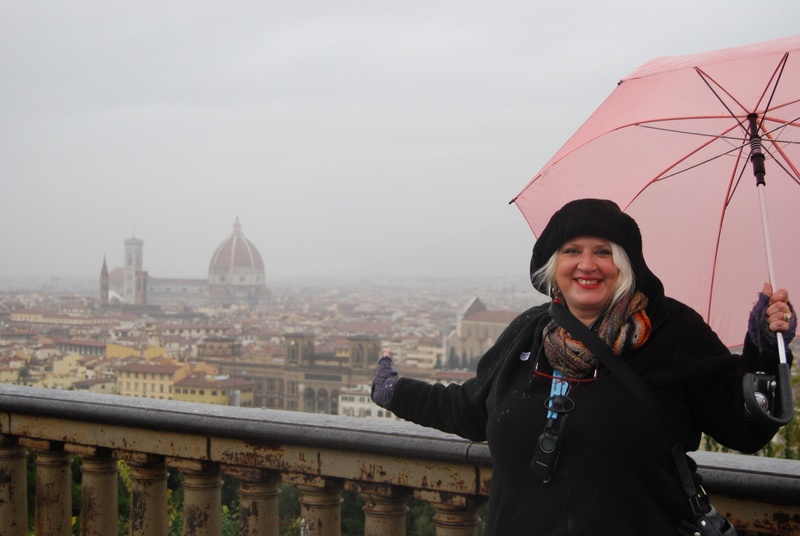 Yes, it rains even in Florence. 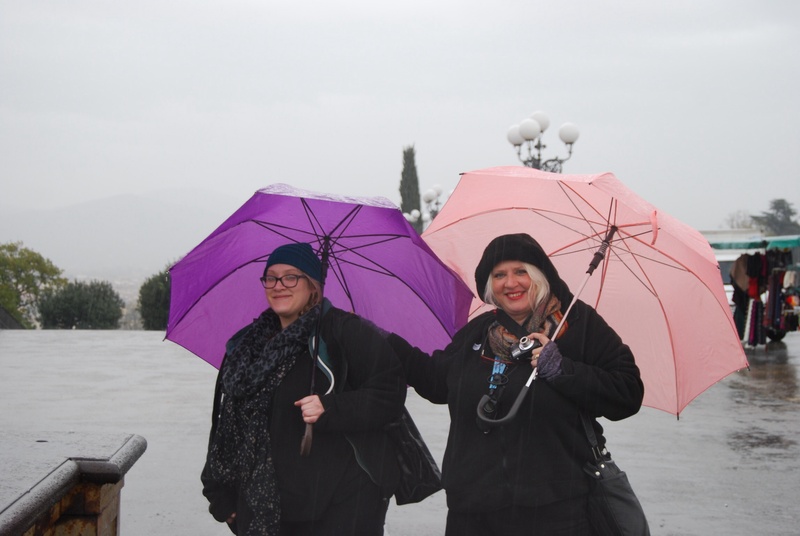 Umbrellas, rain coats, rain ponchos and rain boots crossed all the language barriers. They were used all around the world. 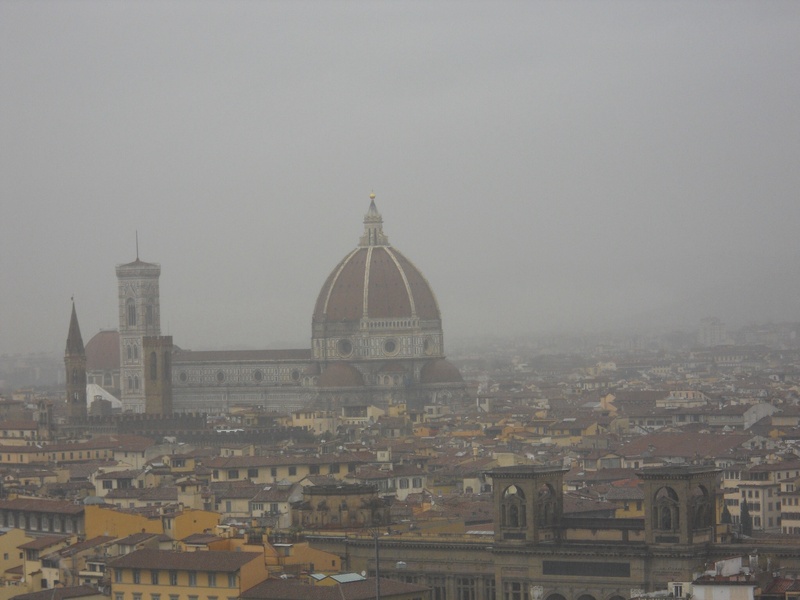 And so, in the drizzling rain, there we all stood and stared at the glory of Florence and the architectural achievement of the Duomo. We could easily be looking back in time by several hundred years. “Beauty must suffer,” was the other. Oh, the hours she spent hours rolling my long and stubborn straight hair up into those infernal pink and blue clips. You can’t imagine how annoyed she would be when the very next day, my hair was totally straight again. I don’t know how many times she tried to perm my hair before she finally gave up. When she was brushing my hair and putting it into tight ponytails. “Beauty must suffer…” as I tried on my first bra, got my ears pierced and when she tried to teach me how to put in my contact lenses. And now my dear Mother is gone. All I have left of her are thousands of pictures to remind me how truly lovely she was. My mother was guilty of it. Even my grandmother, God love her, was guilty of it. You’re probably guilty of it too. 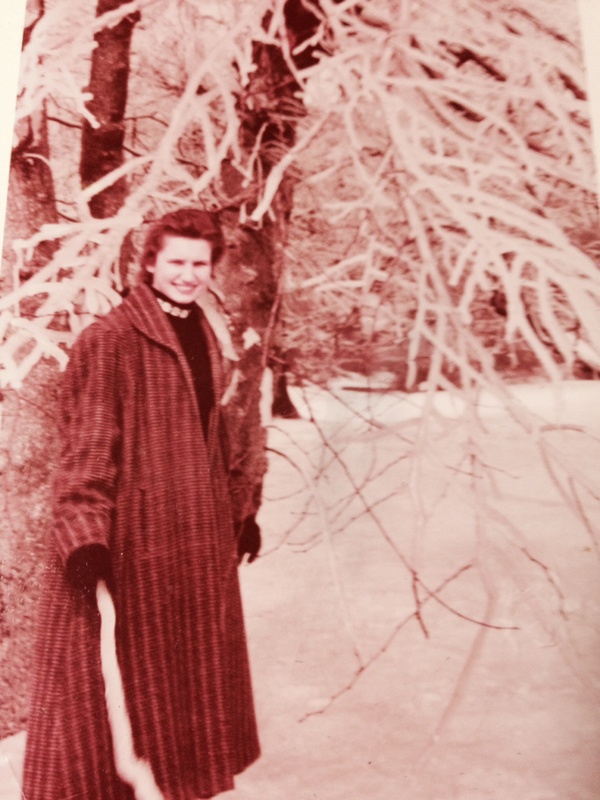 My Grandmother was quite predictable when it came time to taking her picture. The glasses would immediately come off and then she would launch into the biggest and best smile. Each and every picture that I have of her (with or without her glasses) is special, and I could spend an eternity looking at them all. 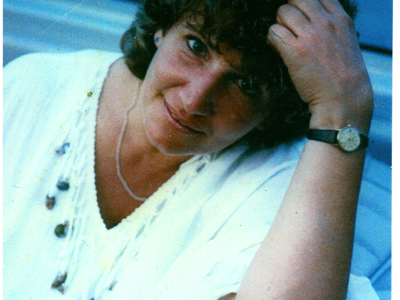 Finally, on our last holiday together, my Mother was a doll and allowed me take her picture, as long as I asked her first. 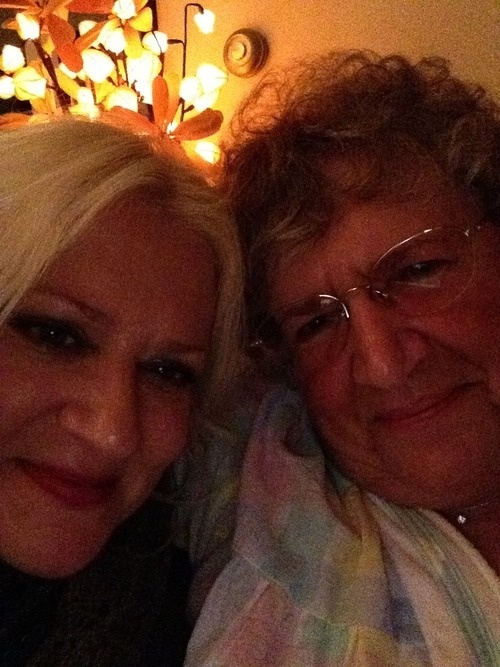 I think it was around that time that I have realized that there is no such thing as a bad picture of my mother, grandmother, kids, partner, or anyone else that I love. Fortunately, neither of my daughters seem to be camera shy. In fact, they seem to revel in front of a camera, so at least I haven’t scarred them.